IN A supposed to be a thrilling championship match between Cagayan de Oro’s best high school teams, Southern Philippines College and Assumption Montessori School, fans of the fully packed Xavier University gym Sunday night, February 3, went home disappointed. 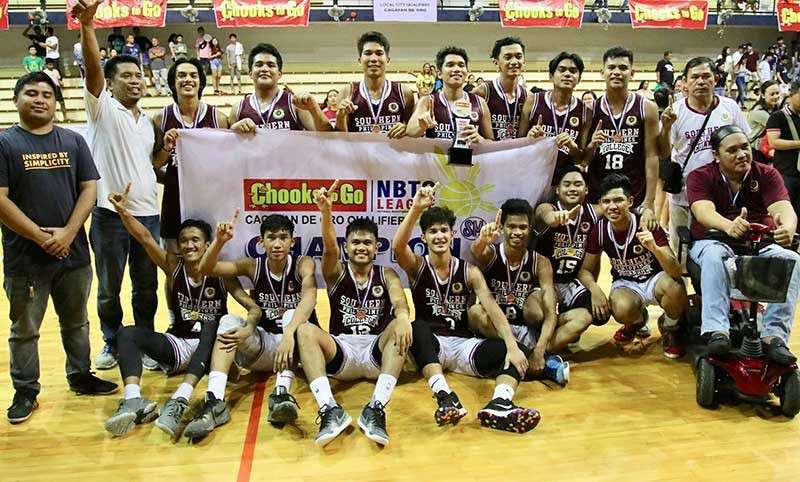 This after, the SPC Sharks pulled away in the second quarter and never looked back to dethrone AMS Jaguars 83-63, to win the championship match of the Cagayan de Oro elimination tournament of the Chooks To Go National Basketball Training Center (NBTC). SPC of coach Reynolds Dangcal started strong taking a 21-13 lead in the first quarter with power forward Jericho Montecalvo dominating the post scoring 12 points most of them from pick and roll plays with point guard Anthony Malinab. The Jaguars of coach James Racines refused to give up and started like a house on fire in the second quarter cutting the lead by only one point 21-22 with 5:35 minutes to go. Tiny point guard Christian Hosain orchestrated the rally and with help from Bon Babia, Marc Lim and Rey Lagbas they almost caught up with the Sharks. SPC coach Dangcal in a brilliant move sued for time out and sent in his seldom used center Janaimer Cabanez. Cabanez then teamed up with Montecalvo to stop the Jaguars rally and secured a 36-27 halftime lead. After that, there was not more stopping for Sharks as Malinab and Montecalvo continued their onslaught in the third quarter sailing to a 36-27 lead. The Jaguars tried to crawl back in the fourth quarter but their guns went silent as only Bon Babia Joswa Mantalaba and Kenneth Samorin managed to score. Their effort however were not enough as eight players from SPC hit their targets dominating further and pulling out an unreachable 20-point lead at the end game. “I won them all except this. This is the result of our intense preparation. We won because we were prepared plus with lots of prayers. Thank you God,” said paraplegic SPC coach Reynolds Dangcal who once played for the Letran Knights in NCAA in Manila. He met a motorcycle accident few years back and has been wheelchair bound. However, he uses a mobility scooter while coaching in the sidelines. It was a sorry loss for the Jaguars and coach Racines who were 10-1 favorite agains the Sharks. “We will concentrate on the Palaro,’’ said AMS school team owner Jorey Alfaro. AMS will represent Region X in the Palarong Pambansa on April in Davao. Chooks To Go representative Rodimaer Lomoya gave out the trophies and medals to the winners with organizer Arvin Martinez during the brief awarding ceremony. SPC 83 - Montecalvo 26, Malinab 15, Cabanez 12, Laniton 11, Popiolek 7, Libago 6, Caterbas 5, Alvarado 2, Suello 1. AMS 63 - Babia 16, Mantalaba 14, Lim 9, Hosain 8, Samorin 9, Rey 3, Reed 2, Halina 1, Antigua 1 Quarter scores: 21-13; 36-27; 62-41; 83-63.